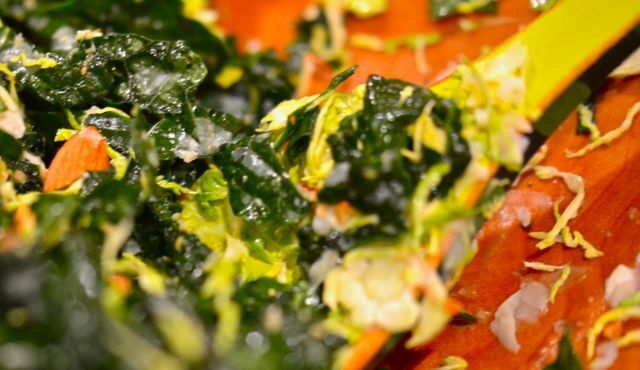 Massaged Kale and Brussels Sprouts Salad. Of all the vegetables we grow and eat here at the farm, brussels sprouts are one of the most challenging. Our attempts to grow them fail (and they attract a massive amount of aphids) and the only brussels sprouts recipes we like usually have tons of bacon and bacon fat to enhance the flavor. 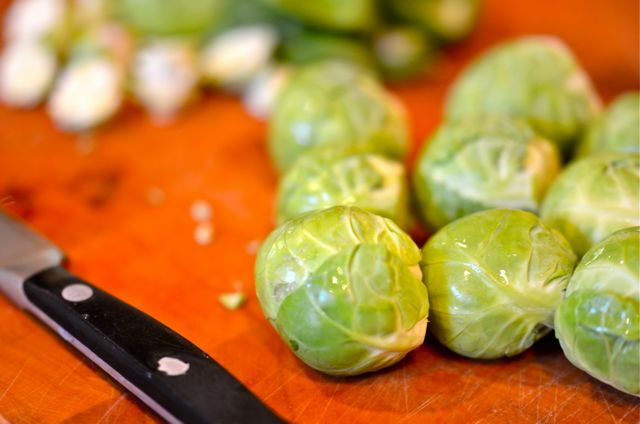 While we do love our bacon, we would like brussels sprouts to taste good on their own. After multiple failures, we usually avoid brussels sprouts, but every once in a while we try a new brussels sprouts dish in a restaurant or see a recipe that sounds promising. Usually, we are disappointed. But not this time. Carolyn tried this salad at a restaurant (Bar Bocce in Sausalito) and we adapted it for home cooking, and it’s very good- we didn’t even have to add any bacon. And, oddly enough, what we needed to enjoy the brussels sprouts was some different technique and the addition of another veggie. 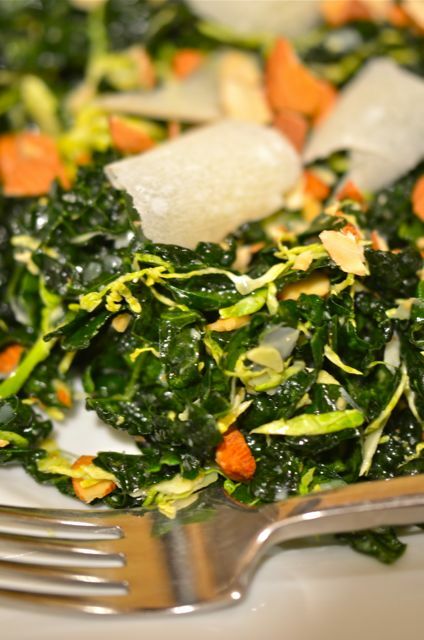 For the technique, we use finely shaved raw brussels sprouts, and for the extra veggie we added kale. One might not expect two earthly vegetables to compliment each other, but the sweeter sprouts play well with the “briny” notes of the kale. 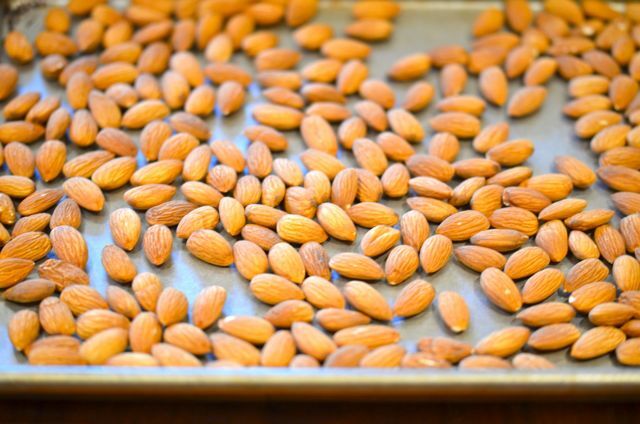 Add some roasted almonds for crunch and nutty flavor, shave on some romano cheese for salt and umami and finish with a bright, acidic dressing and you have a delightful salad. Simple enough, but there is one extra step that makes this salad really sing, the “massage”. And no, there is nothing creepy about massaging your kale. 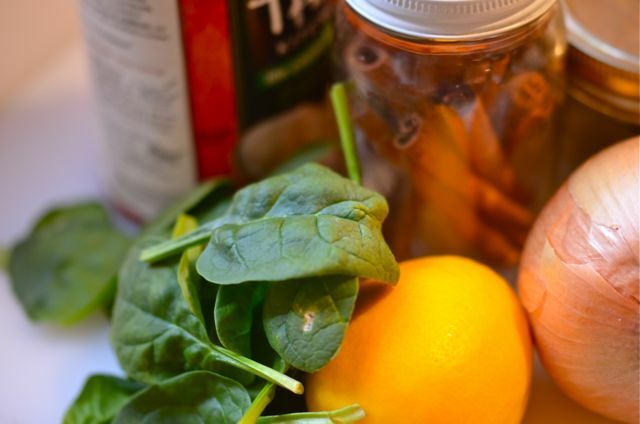 What’s really going on is that you add some of the lemon juice from the dressing to the kale and sprouts, mix or “massage” the juice with the greens and then let them sit for 5 to 20 minutes. 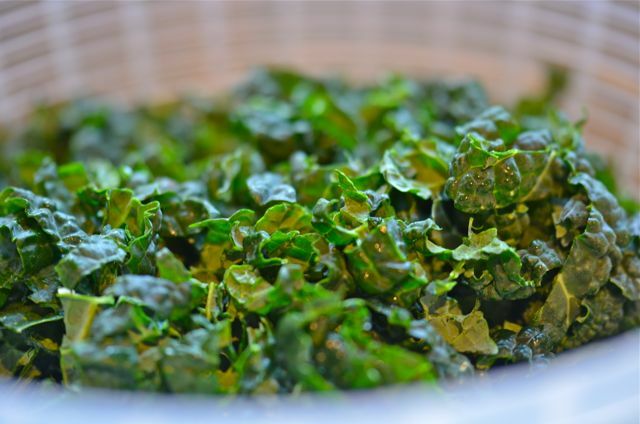 The acid will actually start to “cook” or soften the kale and sprouts. 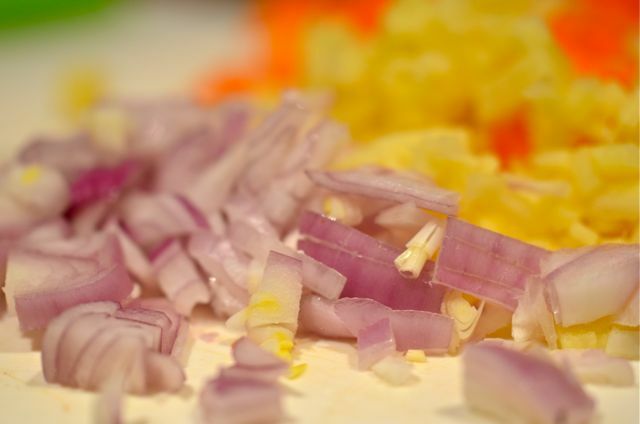 It makes a big difference in texture of the salad. 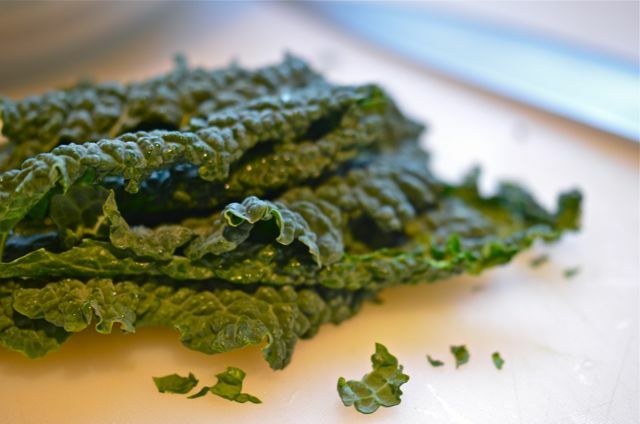 Usually dressing a salad too early makes it wilt, but for a tough green like kale, this is a good thing. (This approach will work for most kale-based salads). A few other notes about this salad. Firstly, the kale and sprouts are very hearty, so you can store the salad, dressed, in the fridge for a few days- so go ahead and make a big batch, if you like. Secondly, if you want to make a vegan version of the salad simply substitute the cheese with caramelized shallots. It won’t be exactly the same, but it will still be very good. And finally, it is best to shave the brussels sprouts with a small hand slicer or mandolin, but if you don’t have these tools use a very, very sharp knife and take your time. Brussels sprouts can be slippery little suckers, be careful…and then enjoy a very healthy and tasty salad. 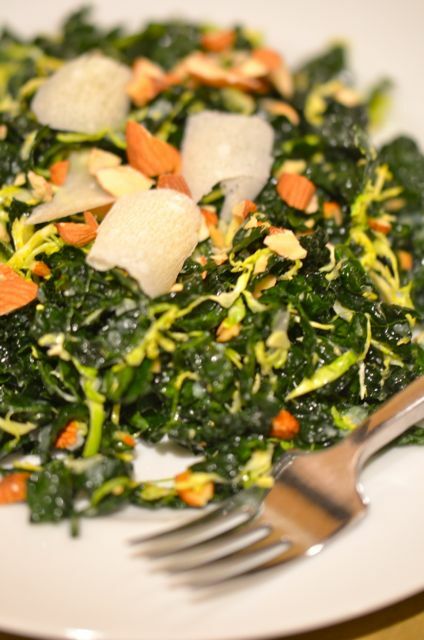 We use lacinato kale for this dish but most types of kale will work in this recipe. 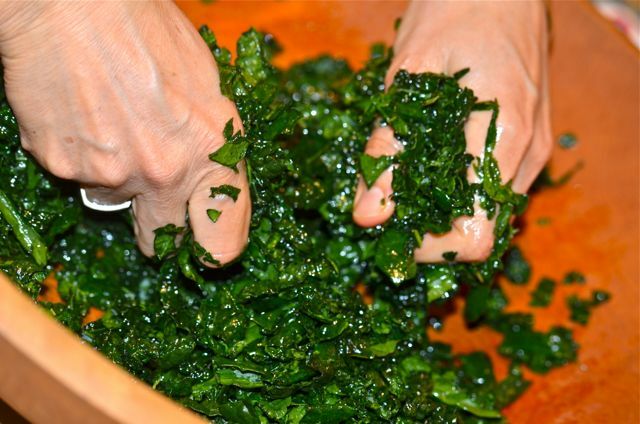 Just be sure to remove the tough ribs from the middle of the kale. What You Get: A good recipe for brussels sprouts that doesn’t hide them behind bacon or fat. What You Need: No special equipment required. But a small hand slicer or mandolin would be a big help. How Long? About 30 minutes with 10 minutes of active time. Anytime dish. We will start by letting everyone know that this is a vegan dish. We will also let everyone know (in case all the bacon posts didn’t give it away) that this is not a vegan, or even vegetarian, food blog. 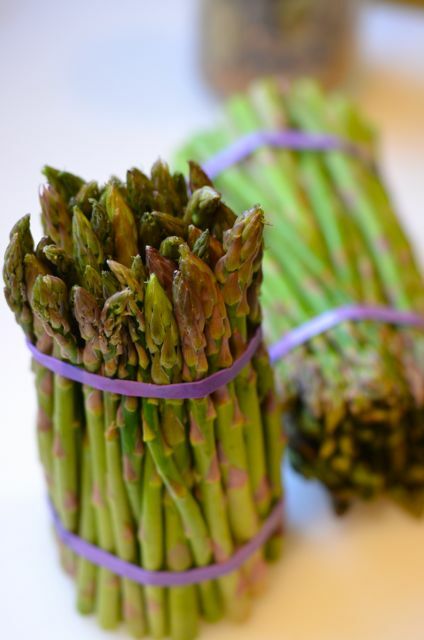 But we are mostly agnostic here at the farm, if we see a recipe that looks good we are going to make or adapt it. 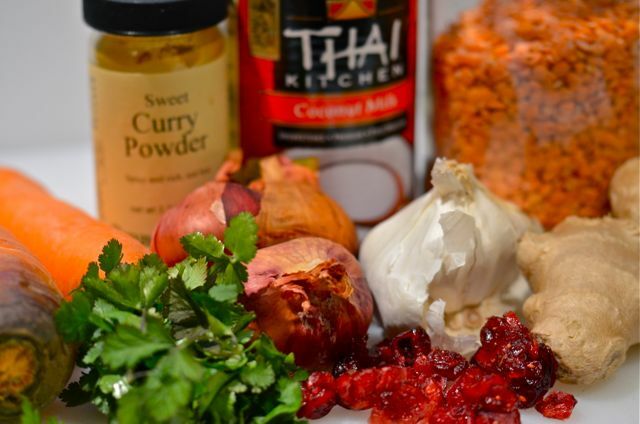 And in this case we saw a Sunset Magazine recipe combining squash or pumpkin, coconut and curry. 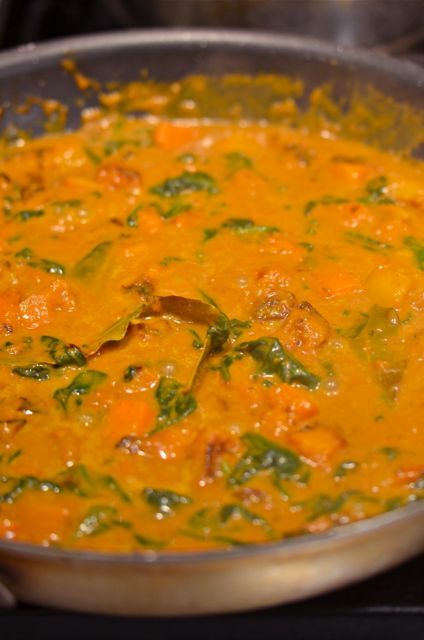 As we like squash and curry dishes (see here), we figured we would tweak the recipe. It only occurred to us after making the dish that it was vegan. But since we never knows who is coming to dinner, we may as well have a few vegan recipes at the ready. And, to be fair, we would make this dish any time. 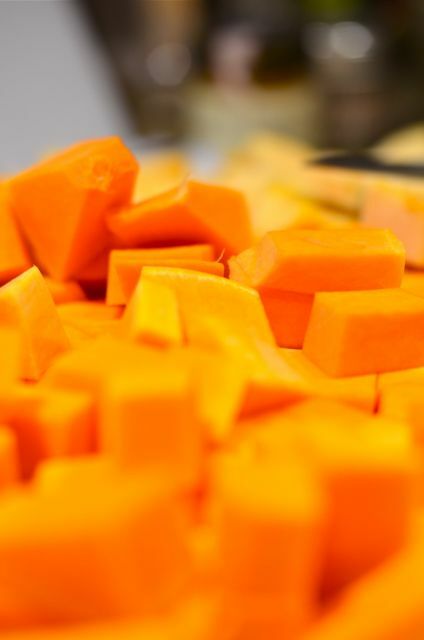 The sweet and hearty squash always seems to work with deep, spicy curry, and the coconut milk adds a welcome sweet and creamy dimension. 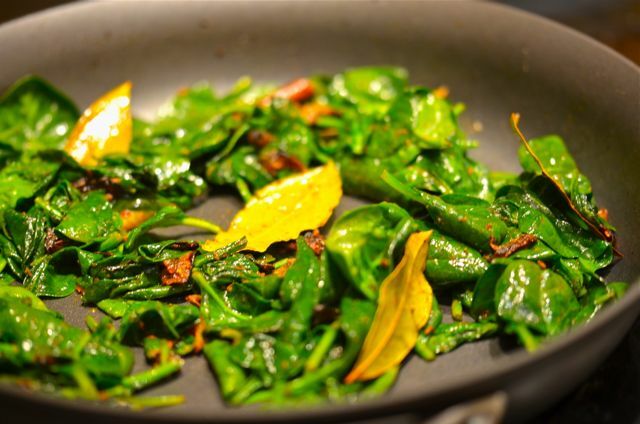 We add spinach both for flavor and some extra greens. 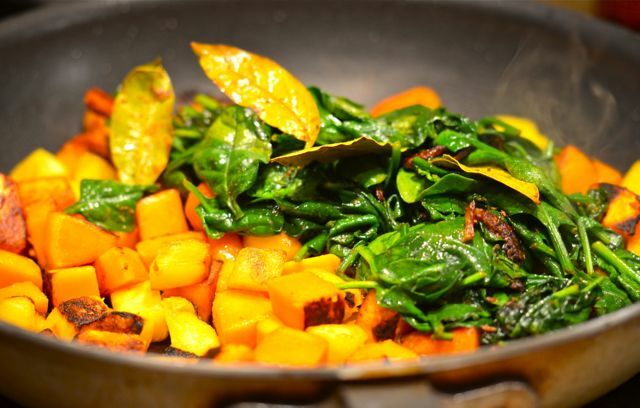 The bright, slightly bitter and astringent notes of the spinach play very well with squash and coconut (think Thai soups). 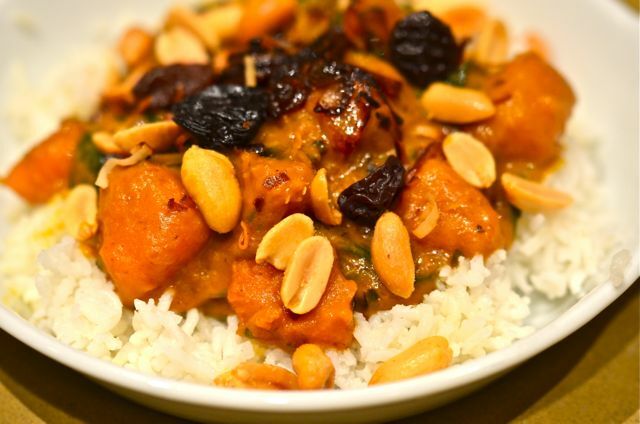 We add some citrus for acidity and toasted coconut, dried fruit and peanuts for flavor and texture. Overall, this is a complete dish. 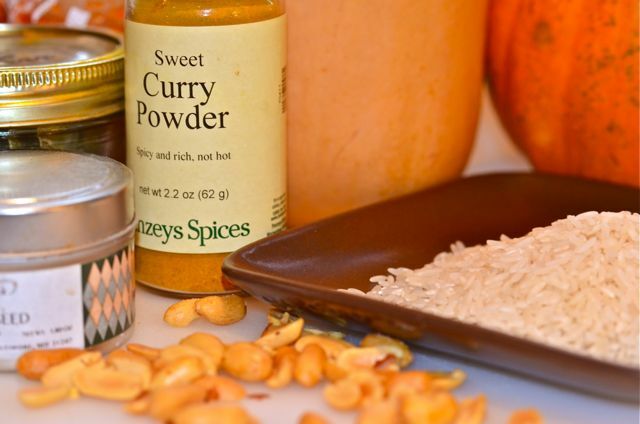 Put the curry on some rice, maybe drizzle on some Sriracha, and you are ready to go. The only issue with this recipe, and many vegetarian dishes, is that you do need to spend a little extra time to develop the flavors. 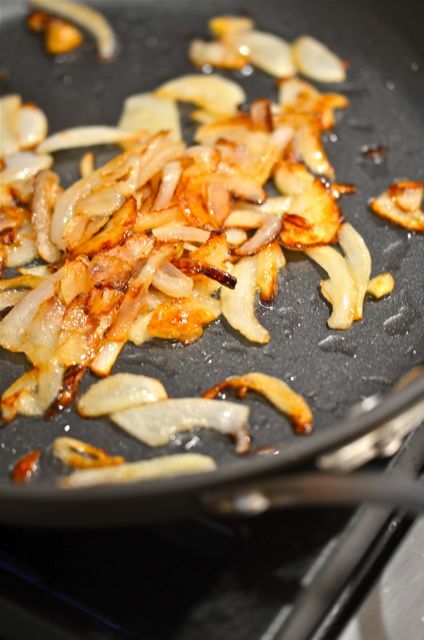 Let’s face it, animal fat and protein have plenty of flavor and make it easy to quickly add depth to many dishes (think butter or bacon fat). 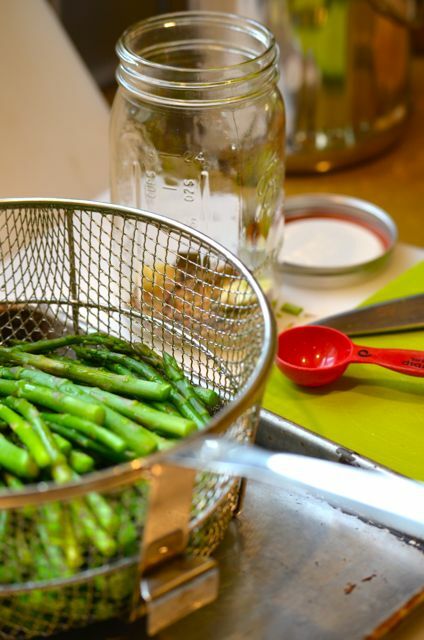 With vegetarian cooking and/or using high-moisture ingredients like vegetables, a few extra steps and a little extra time are needed to remove water (water has no flavor) and concentrate flavor. 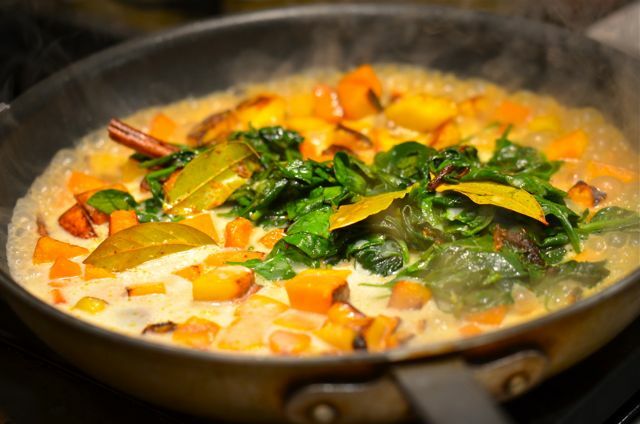 In this dish, the key is to caramelize both the onions and the squash before adding the spices and coconut milk. The extra browning adds more sweet and umami-like flavors that bring this dish to life. It takes an extra 20 minutes or so, but it’s worth it. Putney Farm Guacamole and a cold beer. Well, the Niners did make it to the Super Bowl, so our series of snacks for the big game will have a more positive note (and perhaps some hints of red and gold). 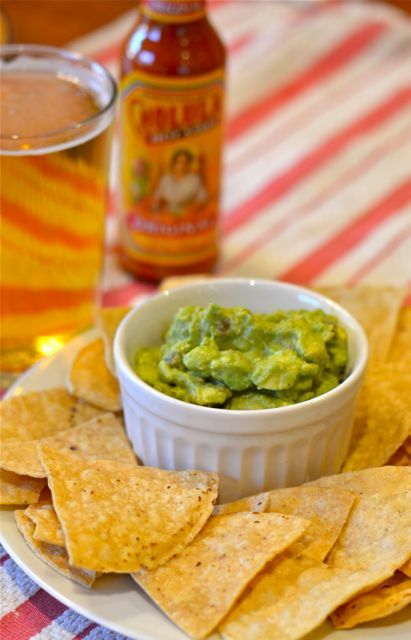 And we will have to come up with a cocktail to celebrate the event….but for now, let’s look at that big game staple, guacamole. According to some very precursory internet research, Americans eat over 8 million pounds of guacamole on Super Bowl Sunday. 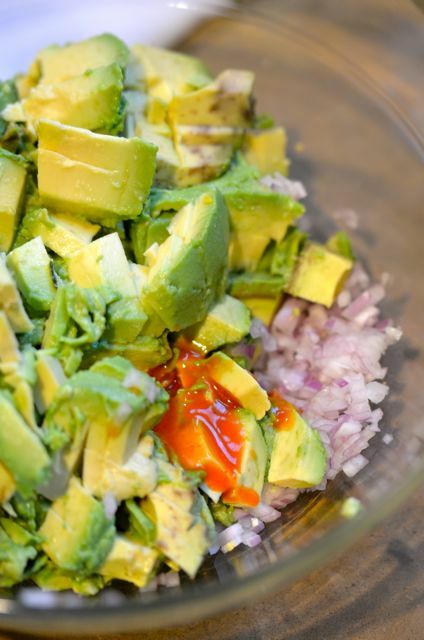 But what that too often means is millions of pounds of avocados get mixed with something like salsa and mashed up. 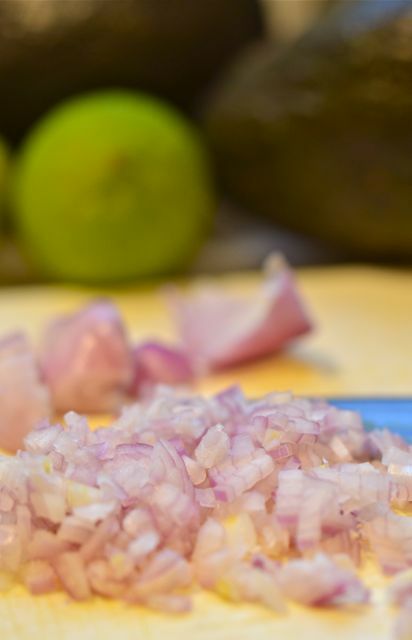 Other than the color, evidence of avocado is often masked by copious garlic, citrus, tomato and pepper flavors. Good, but really “avocado salsa”. 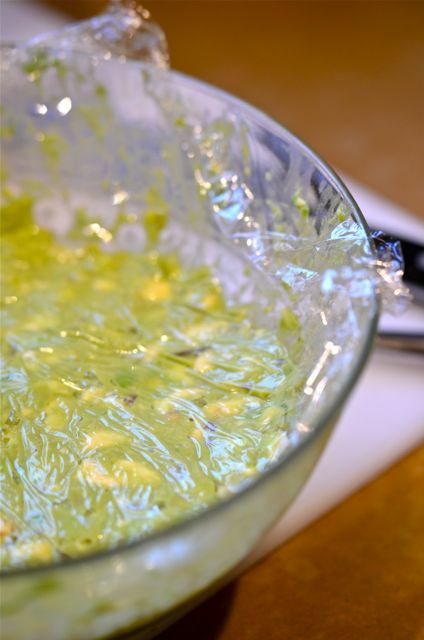 There isn’t necessarily anything wrong with this type of guacamole, and if you have a recipe you like, please use it. 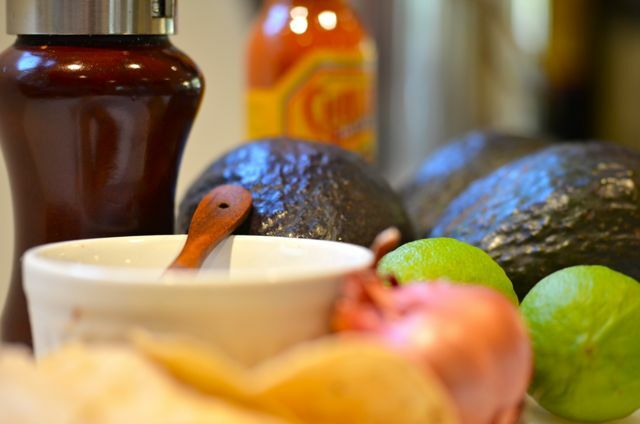 And if the avocados aren’t at their best, adding more flavors will certainly help. But what if you have really good, ripe Hass (you really want Hass) avocados? We suggest you cut one open and taste it. Maybe add just a dash of salt. Doesn’t it taste great? Sweet, clean and creamy with some earthy notes? Beautiful color? Yes? Then maybe you can try a version of guacamole that is all about the avocados. And we do have a basic recipe that really works when avocados are at their best. 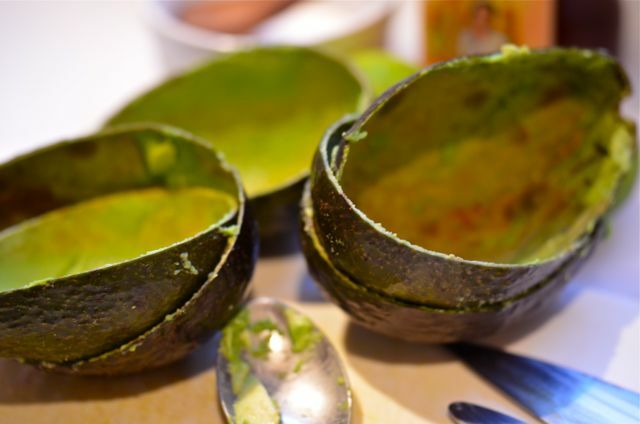 Three avocados, one minced shallot, the juice of half a lime, a teaspoon of salt, a pinch of black pepper and a scant teaspoon of hot sauce. 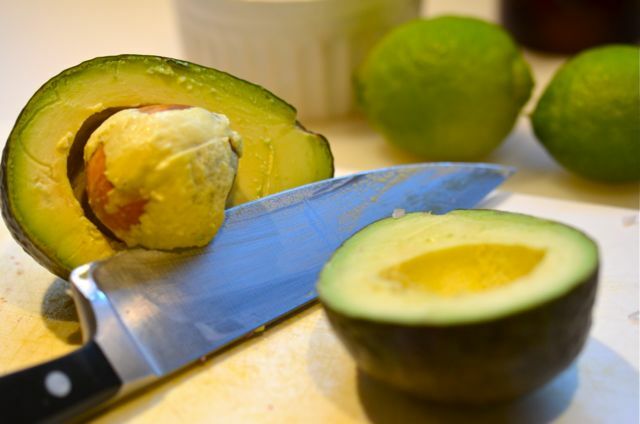 Dice the avocados with a butter knife in their skins (see the photos). Add the diced avocado to the other ingredients and fold them together, so some of the avocado chunks mash, while some keep their shape. 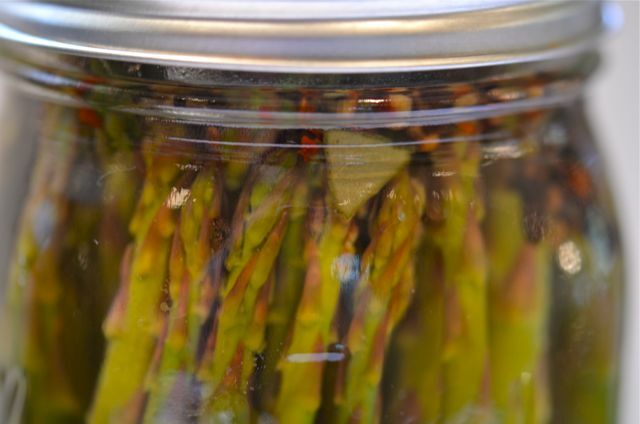 Taste, tune (just a bit) and refrigerate for at least three hours. 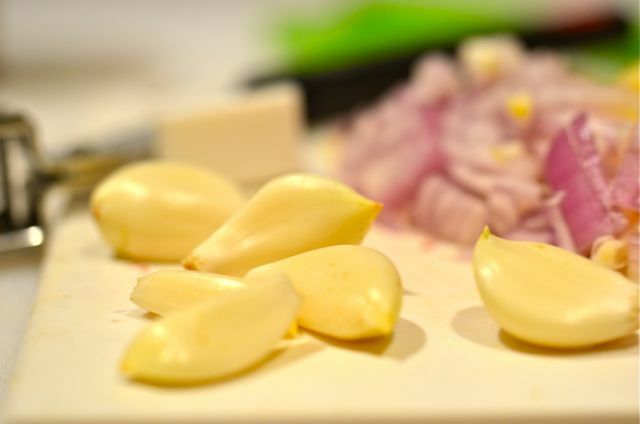 The taste again, the flavors will have melded and mellowed. Season with more salt, lime and/or hot sauce one last time, and then serve. Happy Monday! Happy MLK Day! And Happy Inaugural! We hope everyone enjoys the long weekend (for those who have it). Meanwhile, we always enjoy long weekends as an excuse to cook and visit with friends. Saturday we had a lovely evening with friends and Sunday we got to cook this soup, and we are glad we did. We wanted to play with red lentils for some time and after enjoying this soup, we only wish that we had done it sooner. 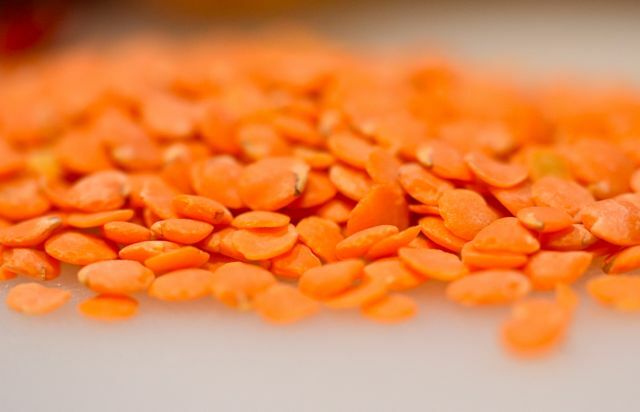 We are big fans of lentils, but usually cook with the brown / green French lentils and in more Mediterranean-influenced dishes. 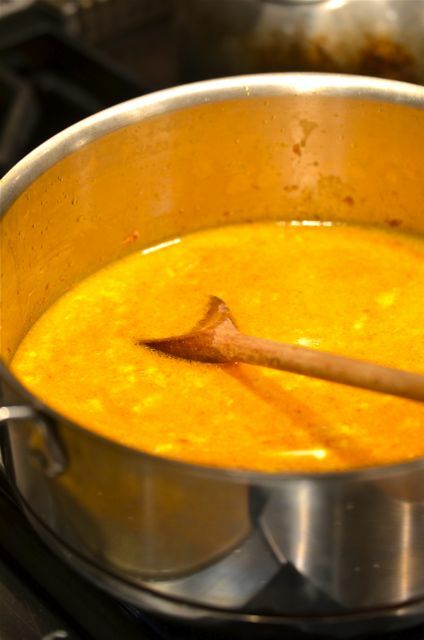 But lentils are also a staple of south Asian cuisine, so we bought some red lentils and pulled out this soup recipe with red lentils with a strong dose of curry and ginger. 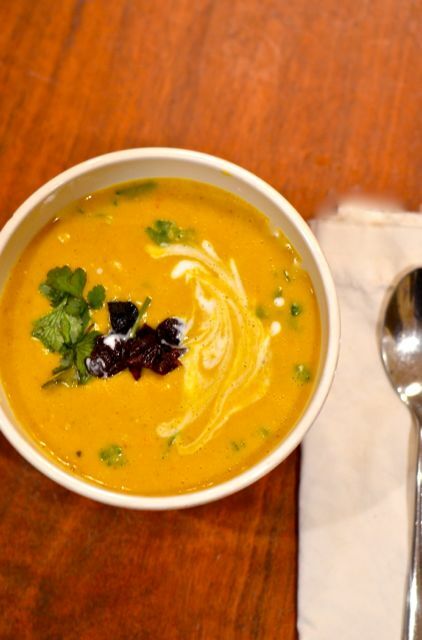 The soup is a real winner, combining earthy flavor from the lentils, the warm and cool notes of the ginger, sweet coconut milk and the deep spice of the curry. 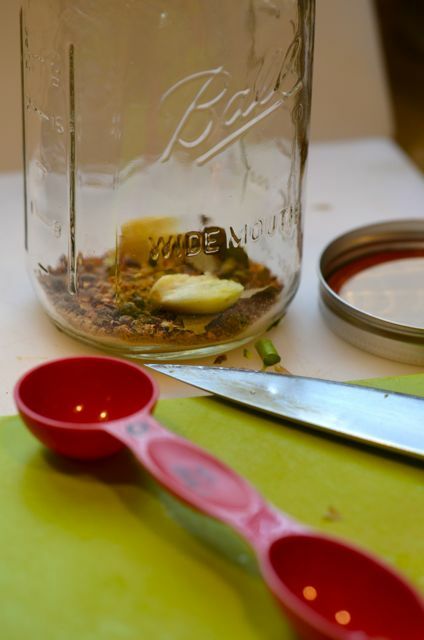 Add a little dried fruit and/or nuts and you have a complete, and very satisfying, meal. So good, both our boys liked it the first time out. 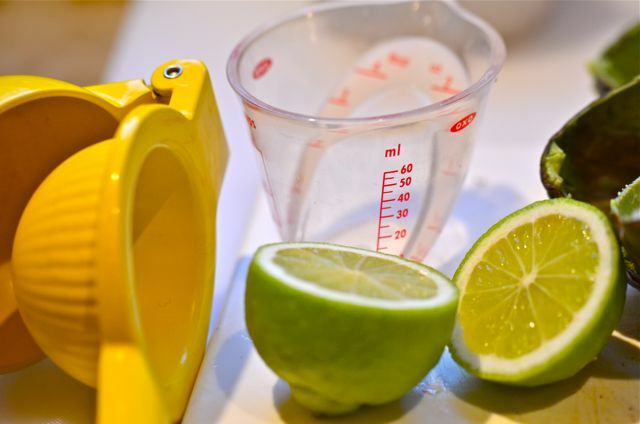 The recipe comes from Martha Stewart, but we do add some extra flavor and simplify the process somewhat. 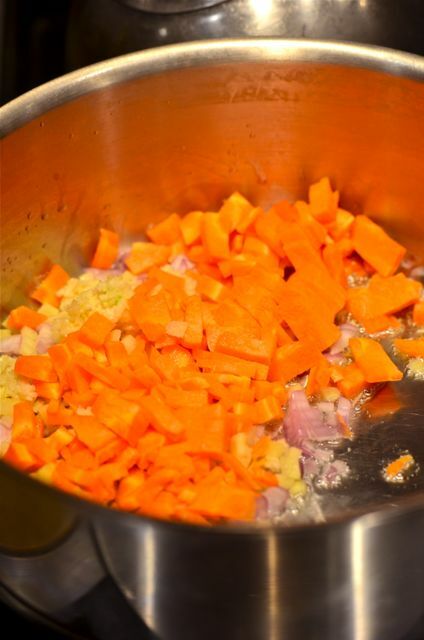 Making the soup is as easy as dicing ginger and aromatics, softening them with the curry, adding the lentils and simmering with water and coconut milk. 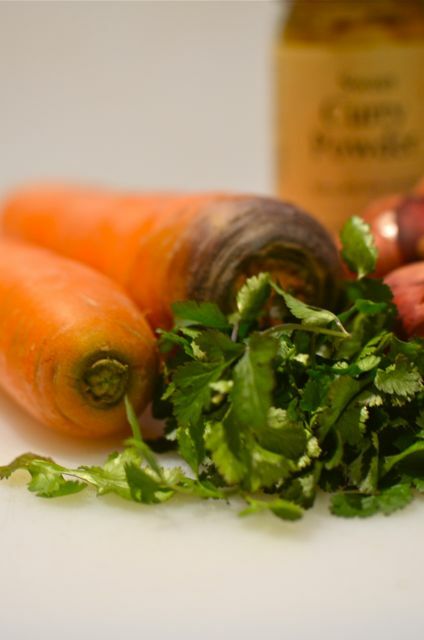 But there is one caveat, you do need to blend this soup. You can use an immersion blender if you have one (this is the easy way), or ladling the soup into a blender, but you must purée the soup. 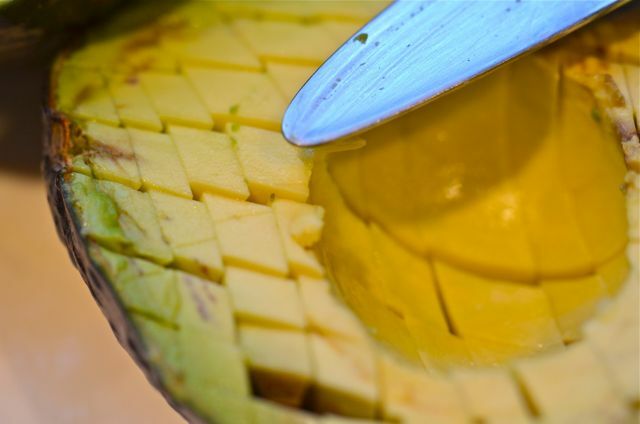 The issue is the use of fresh ginger. 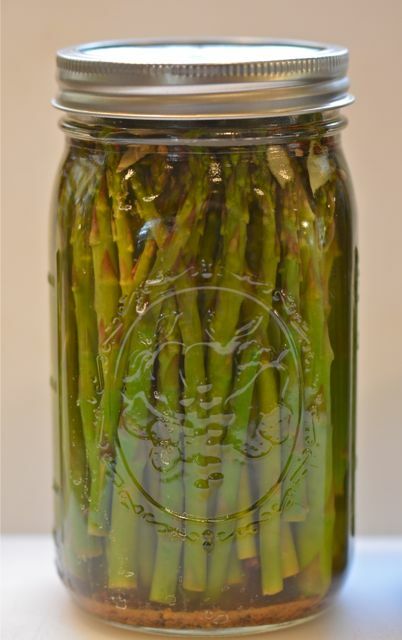 It adds flavor, but the fibrous chucks of ginger are very unappealing if you take a bite of one. Puree the soup. It is a bit of a fuss, but very much worth it. Before we start, we apologize for the slightly monochromatic look of the blog these days. Between last week’s roasted parsnips and this post for spiced, roasted cauliflower, we are cooking a lot of white-ish veggies. But what makes for somewhat challenging photography can still be good food, and such is the case with this cauliflower dish. As anyone who knows their vegetables will tell you, roasted cauliflower with a touch of oil and spices is terrific, and for what it lacks in color, it more than makes up in flavor. And the rest of the world seems to agree. 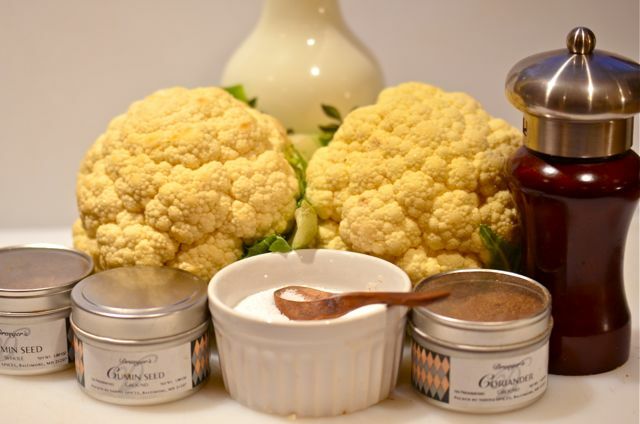 From India to Europe and here in America, many cuisines embrace the cauliflower as a healthy, flavorful vegetable. And it is worth noting that cauliflower comes in many shapes and sizes. You can find orange, purple and green cauliflower in many markets along with the fractal geometry shaped Romanesco variety (very tasty in salads, btw). In all cases cauliflower is nutrient-dense, particularly vitamin C, and has very high fiber. This stuff is good for you and tastes good. Now you just need to cook it right. And that is where choosing the right cooking method makes a difference. You can certainly steam or boil cauliflower and serve it with butter, salt and pepper. And cauliflower, cream, cheese and a touch of herbs makes for a lovely (if somewhat less healthy) dish. 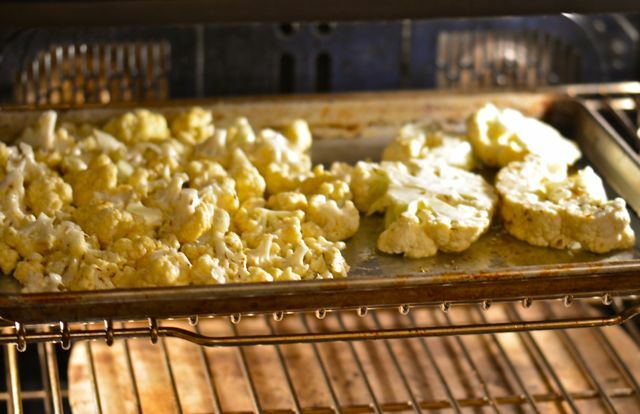 But oven roasting is where cauliflower really starts to sing. 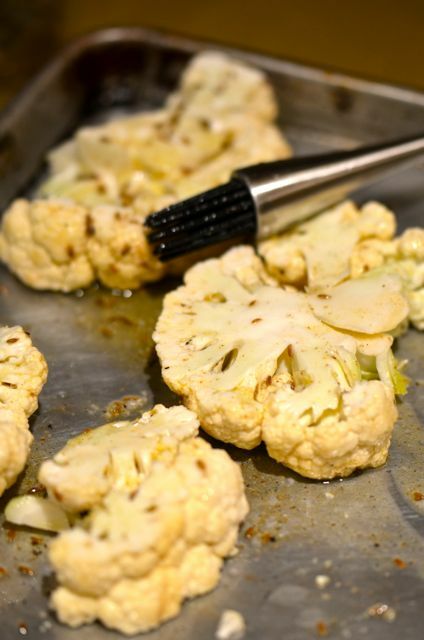 Cauliflower is naturally earthy and sweet and when you roast with a touch of oil and seasoning the flavors concentrate and you get a touch of caramelization. 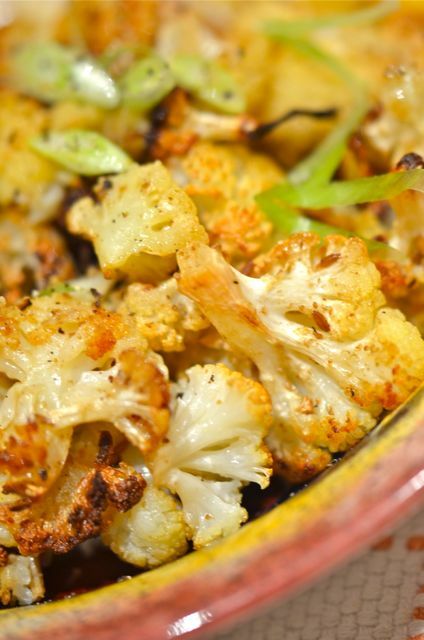 If you add some strong, aromatic spices to the roasted cauliflower like cumin or curries, then you suddenly get a truly complex and flavorful dish. 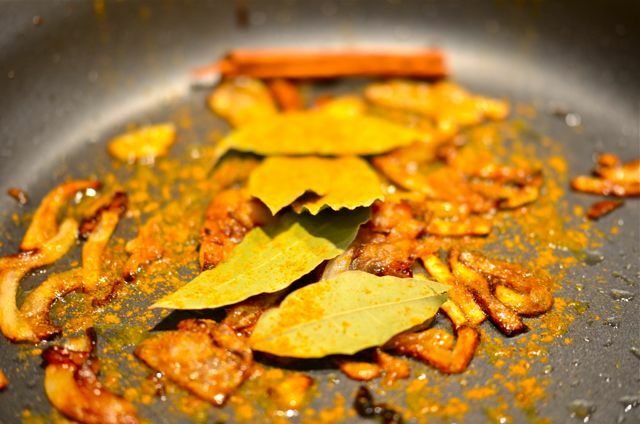 We prefer to use a bit of cumin and coriander, but curry certainly works well, as do savory herbs. Feel free to adjust this basic recipe to your taste. 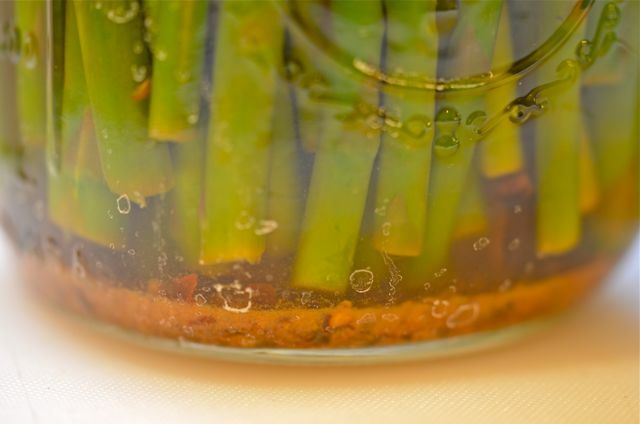 The recipe is very simple and only takes about 30 minutes. 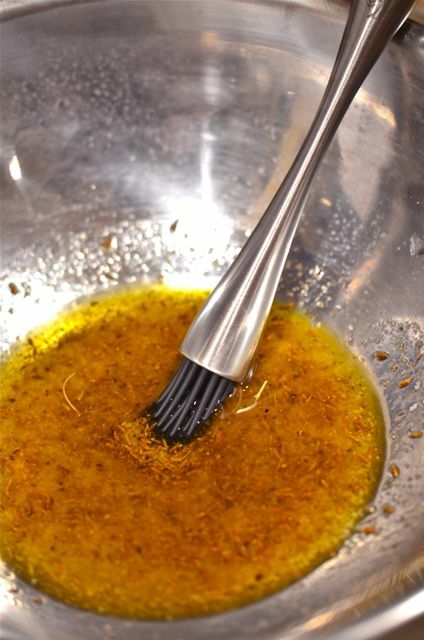 You just make a paste of olive oil, salt, pepper and spices or herbs. 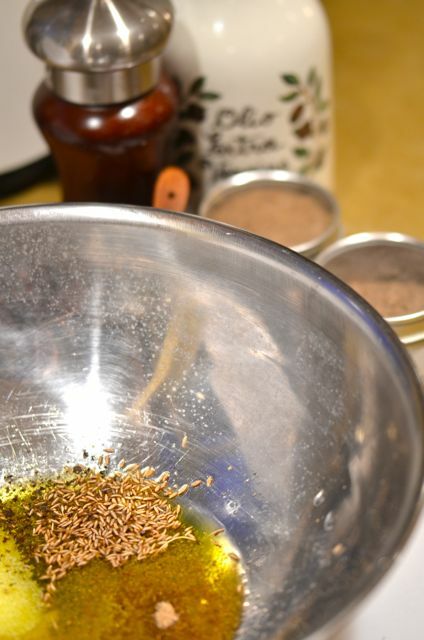 We use ground cumin, cumin seeds and ground coriander. 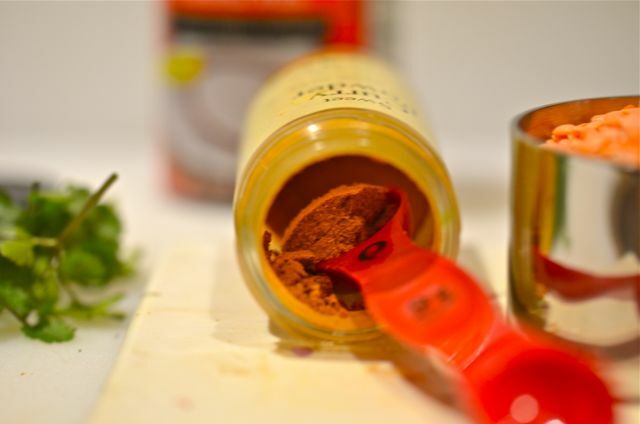 (FYI, you can briefly warm the spices in a dry pan over medium heat to “wake them up” a bit, this is worth the effort). 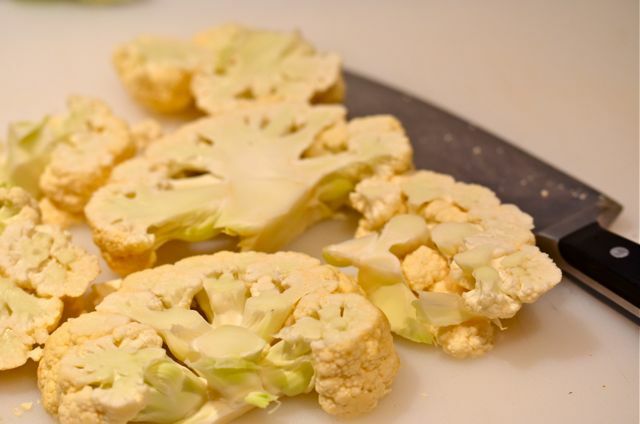 Besides the spices you use, the only choice is how you prepare the cauliflower. 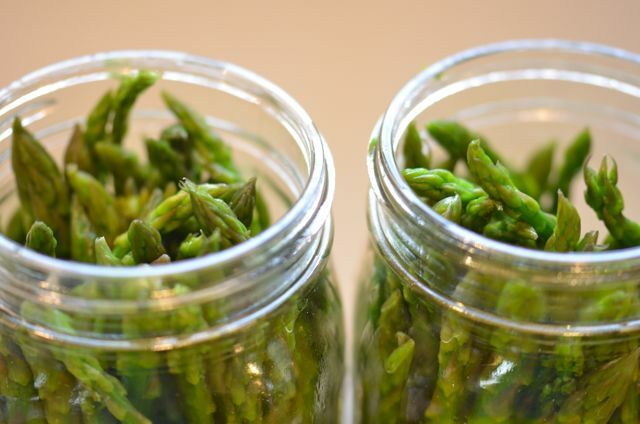 You can cut off the florets and toss them in the oil and spice paste, put them on a baking sheet and roast in a 425 degree oven for about 25 minutes. Or, you can cut thick slices or “steaks” from the cauliflower and brush the spice paste onto each side, and then roast in the oven (another good cauliflower “steak” recipe here from the SF Chronicle). 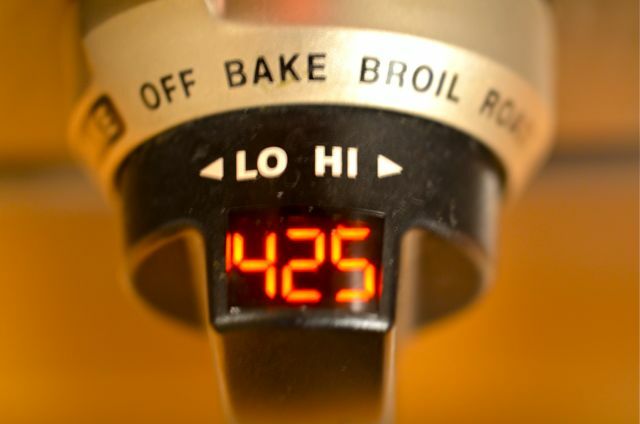 We like both methods, the only extra work is to be sure to flip the “steaks” halfway through cooking.